You can mold ice cream, pretzels, cookies, and candies. This looks like it could keep us busy for quite awhile. Thanks for the giveaway! You can make molds of make Oreos, gummi bears and pretzels. My Camille is completely begging for this! As we speak she is in play doh love! She is crazy for it! She makes pretend dog treats for her webkinz!!!! Sundaes and cones! My 3 yr. old would LOVE this!! My daughter is an ice-cream lover! She would be in heaven playing with this toy. Looks like you can make many things including Oreos, gummi bears and pretzels according to your post. The toy link even mentioned an icecream cake? Thanks for the great giveaway. Oreos, pretzels, cookies, ice cream. This looks sooooooo fun. My 4 year old would love this!! We would definitely make some Oreos (household favorite) along with some fancy pretzels. Thanks so much, this looks really fun! Sundaes, milkshakes, and even gummi bears for a topping! My kids could make, ice cream cones, cupcakes, cakes, pretzels, cookies! WOW....They can make everything yummy! My kids would totally have a blast with this! 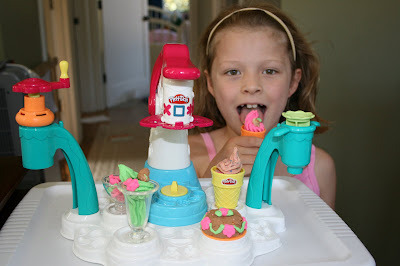 You can make sundaes, cookies, pretzels and ice cream treats with this Play Doh playset. Count me in. I haven't got my kids and new play-doh stuff in ages, and they do love it. Gummy bears, oreos and pretzels, how cool. Yummy Oreos, gummi bears, and pretzels! Ice cream, cookies, gummy bears, cupcakes - this looks like so much fun!